Christmas is almost here! I’ve been trying to add to my Christmas card stash at least one card a week and I’ve used this weeks sketch to get to the total I need. As much as I love non-traditional colours for Christmas, I still think you can’t go wrong with Red, White & Green. 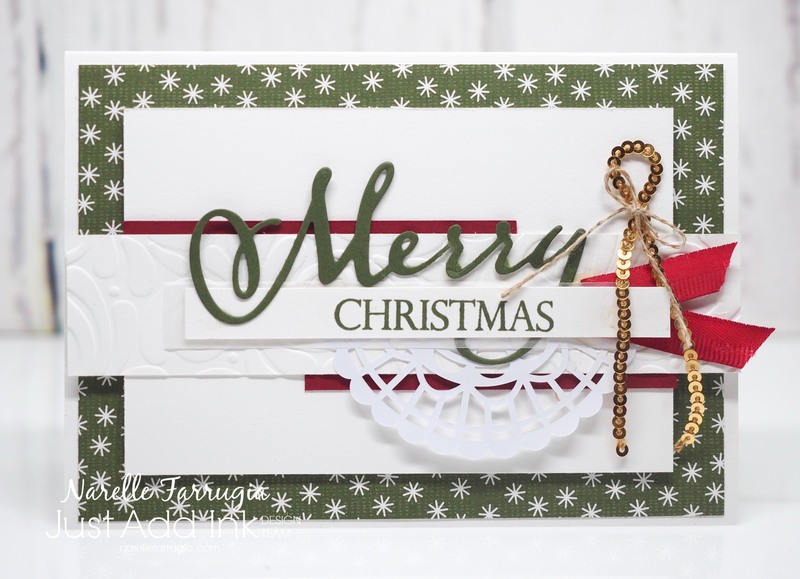 The diecut sentiment I’ve used is from Merry Christmas Thinlits Dies. 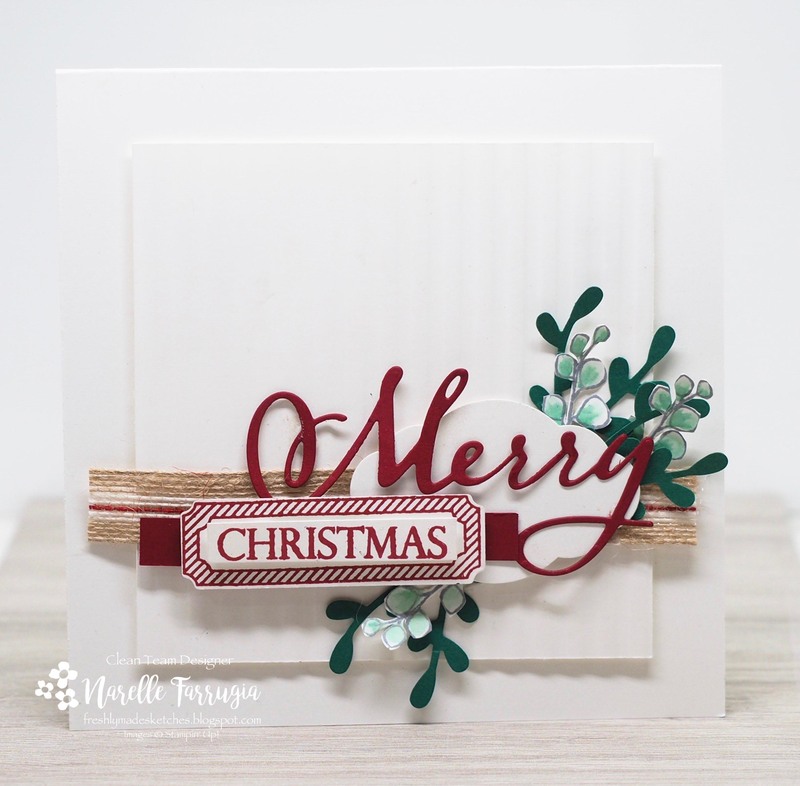 The stamped sentiment is from the matching stamp set called Merry Christmas to All Photopolymer Stamp Set. I’ve stamped this sentiment in Mossy Meadow Ink. 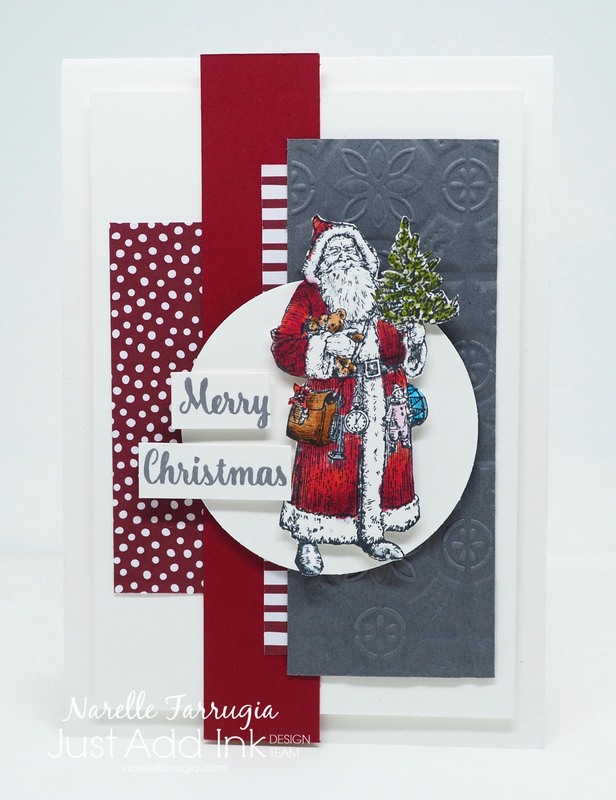 The fabulous designer series paper I’ve used in the background is from Festive Farmhouse Designer Series Paper. The strip across the middle of my card is embossed with my new Swirls & Curls Textured Impressions Embossing Folder. I added strip of Gold Sequin Trim that is tied together with some Linen Thread. Because a card can’t have too many embellishments, I added a strip of Real Red Ribbon 3/8″ Mixed Satin Ribbon that I had sitting on my discarded from another project. I then added half a Pearlized Doily that I also had sitting on my desk. By leaving offcuts on my desk, and on view, I make sure I always try and use them on future projects. Our team have created gorgeous cards with the sketch. Pop over to Just Add Ink and see their creations. We would love for you to play along. I had a bit of fun playing with a new Stampin’ Up! stamp set called Spirited Snowmen for this weeks fab sketch at CAS(E) this Sketch Challenge. 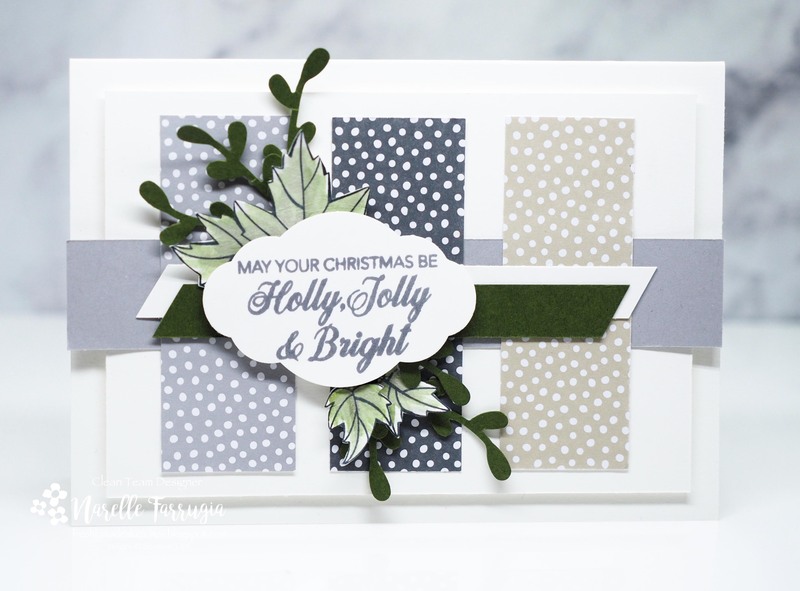 I recently watched a facebook live video by the super talented Anne Marie Hile using Lovely As A Tree and a dryer sheet technique. 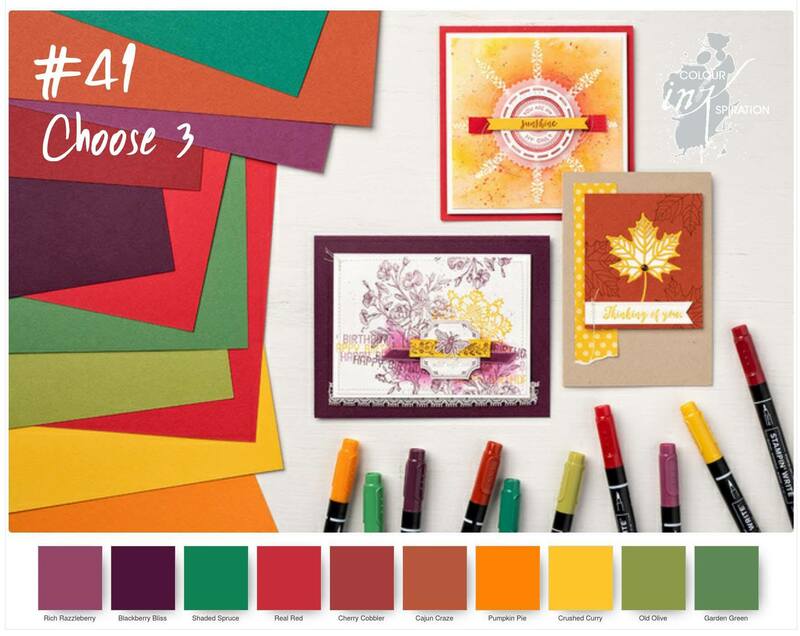 Pop over to her blog by clicking here and take a look at these awesome cards. Seeing Anne Marie use Lovely As A Tree had me thinking how long it had been since I’d inked it up. 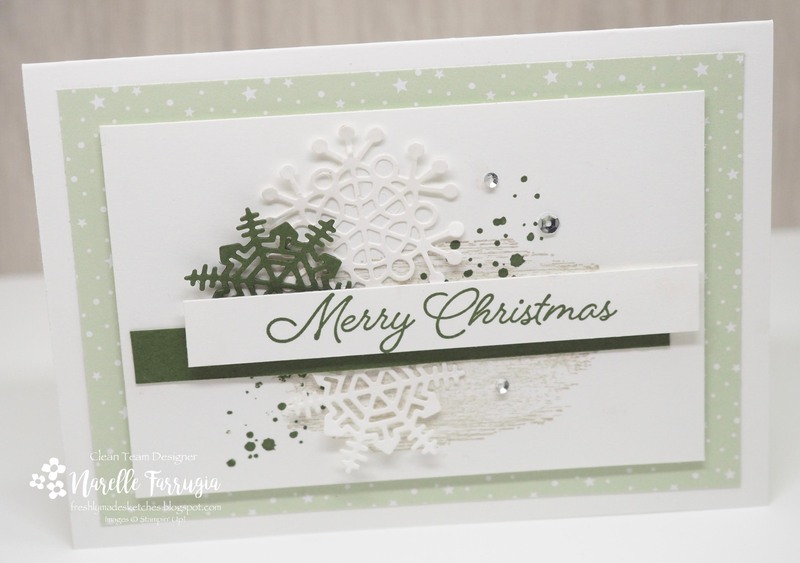 So I gave myself the challenge to use it on an upcoming card – once I found it that was…… I applied my Smoky Slate and Bermuda Bay Markers directly to the tree, huffed on it and stamped it on some Whisper White Cardstock. Once it was fussy cut, I then layered it on my “snow layers” of Pool Party, Whisper White & Bermuda Bay Cardstock. 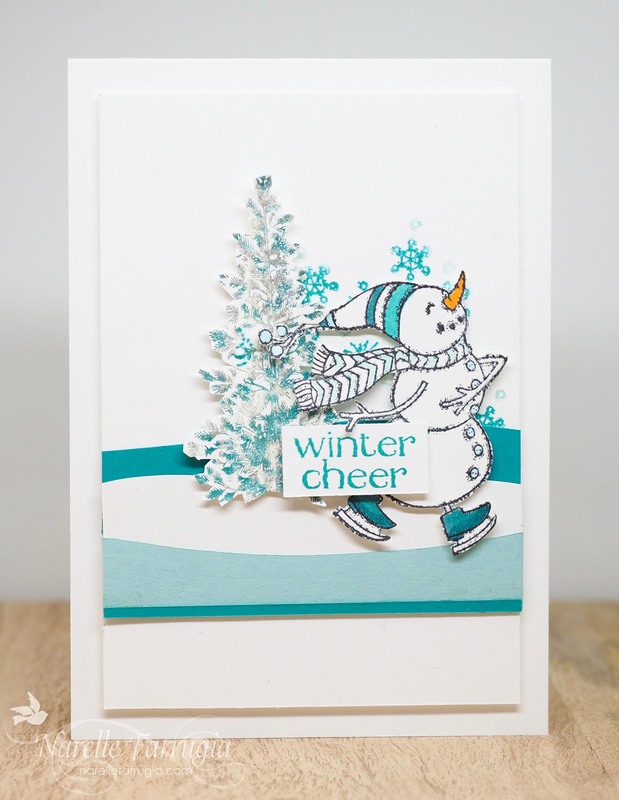 My dancing snowman is from Stampin’ Up!s Spirited Snowmen. I used a combination of Blends to give him some colour to match my snow layers. The sentiment and the background snowflake stamps are also from this set. I’ve stamped them both in Bermuda Bay Ink. 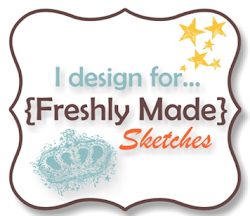 Welcome to another Wednesday and another new sketch challenge at Freshly Made Sketches. This week our sketch has been designed by the wonderfully talented Amy O’Neill. I have used Amy’s sketch to add a card to my Christmas card collection. The snowflakes I’ve used are from Seasonal Layers Thinlits Dies. I’ve used a combination of Whisper White and Mossy Meadow Cardstock for them. 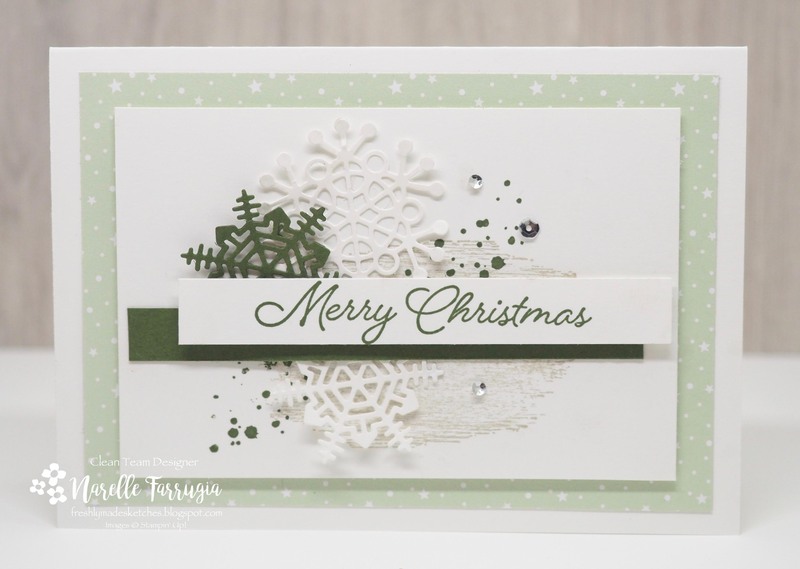 The sentiment is stamped in Mossy Meadow Ink and is from Blended Seasons Stamp Set. 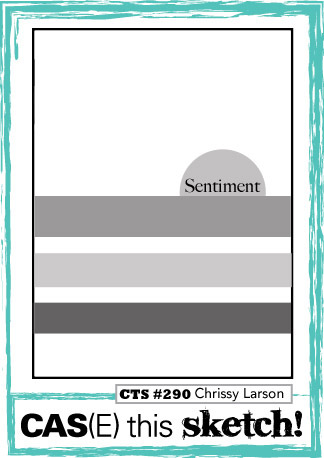 The font on this sentiment is just gorgeous and is the perfect size for a single layered sentiment. The background stamps are from Timeless Textures. I’ve stamped these in a combination of Sahara Sand for the watercolour look and Mossy Meadow for the ink splatters. The designer series paper I’ve used in the background is from Twinkle Twinkle DSP. I love it when you can use papers from a pack that it isn’t typically designed for. I’ve been using this pack for my baby cards, but I think the stars work well for Christmas too! The team at Freshly Made Sketches have created gorgeous cards that will inspire you. Head over to the challenge and take a look. 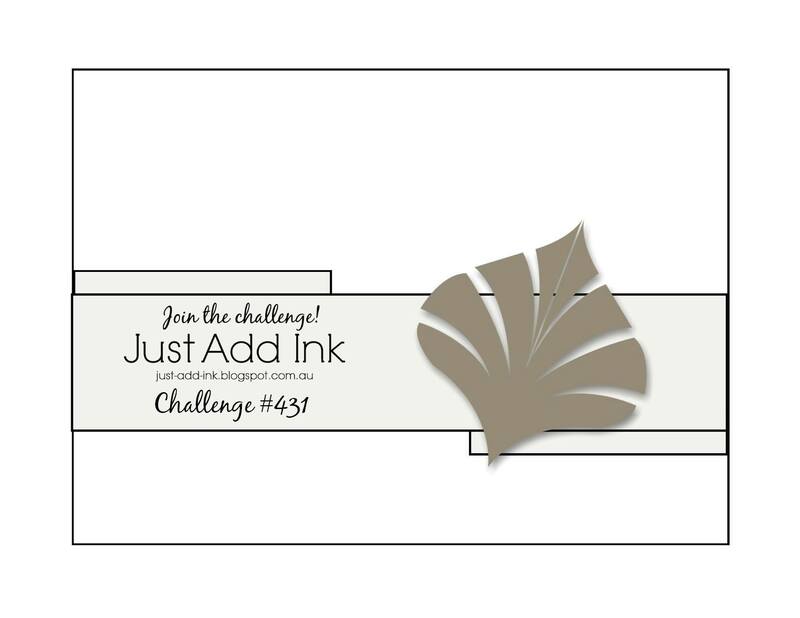 We would love it if you could play along with the challenge.